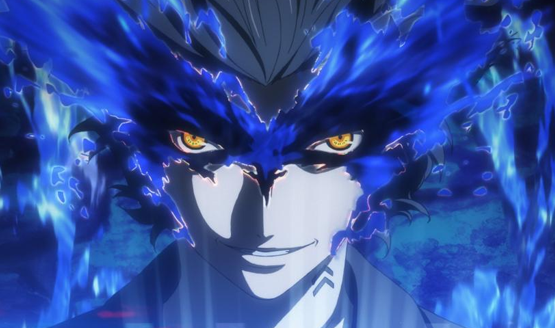 If you’ve played Persona 5, you know that the 2016 smash hit by Japanese developer Atlus is more than just a game, it’s a lifestyle. When I sat down to play in January, I knew that Persona 5 was a time commitment, but I didn’t realize that eight months later and more than 100 hours in, I still wouldn’t have finished exploring the game’s sprawling maps and character arcs. Persona 5 hasn’t just become part of my life, though. It’s become part of my friends’ lives and especially my roommates’. Because my PS4 is in the living room, and because I keep the game’s incredible soundtrack as loud as I can without being rude, we’ve all gotten to know Joker and company. In fact, certain lines, songs, and idiosyncrasies have become part of the way we talk to each other. It’s like we communicate in very specific meme-speak, and all the memes are about Persona 5. Here are some of the weird, delightful ways that the Phantom Thieves have infiltrated our lives. He always says one of these. Over and over. It drives me a little crazy. This (usually) doesn’t lead to finding the keys any faster. But it is funny. “Aria of the Soul” is the stunning, operatic vocal solo that plays in the Velvet Room of every Persona game, and Persona 5 is no exception. As you’re chatting with the Twins or creating rad Persona fusions, a woman sings a high, clear, and wordless melody. The upside: it’s a great song. The downside: it plays on loop, and if you spend a lot of time in the Velvet Room, you will memorize every note of the aria. I’m still amazed that none of our neighbors have called the super on us. Look, I love Morgana. I will never not love a cute, talking cat, but Morgana also drives me up the wall. Whether he’s forcing Joker to go to bed (Joker can make his own decisions!) or inappropriately hitting on Ann (being a cat does not give you permission to be a creep), Morgana sometimes comes off as obnoxious. His most obnoxious trait of all: squealing “It’s almost scary how good I am!” whenever he does something right in combat. One of my roommates threatened to smash the TV if he had to hear Morgana say that line again. Me: Hey, Pete, this stew is really good. Pete: -almost scary how good it is! I can’t blame my roommates, though. I’m the one who brought this curse upon us by playing the game. You know the lyrics to the song that plays while you’re in combat? Yeah, I don’t know either. The Persona 5 soundtrack is killer, but it’s also hard to understand. I have no idea what the vocalist is singing in the combat song, or any other song, for that matter. It’s just cool-sounding nonsense. Since the songs are catchy, though, my roommates and I have memorized these tunes just like we’ve memorized “Aria of the Soul.” We fill in the lines with whatever comes to us first, whether it’s gibberish that makes us sound like we’re speaking Simlish or lines from famous movies. Next time the combat music plays, try filling it with the weirdest lines from The Room. 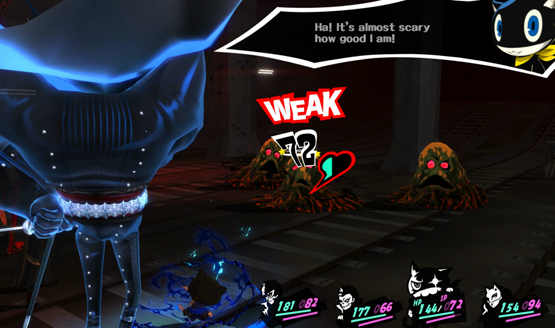 One of Persona 5’s most endearing quirks is referring to characters you haven’t met by their most obvious attribute. Before you learn their names, Ryuji is Vulgar Boy, Haru is Well-Behaved Girl, Akechi is Pleasant Boy, and—my favorite—Yusuke is Unforeseen Boy. This has led to my friends and I trying to figure out what our adjectives would be, just in case we appear as NPCs in a Persona game. 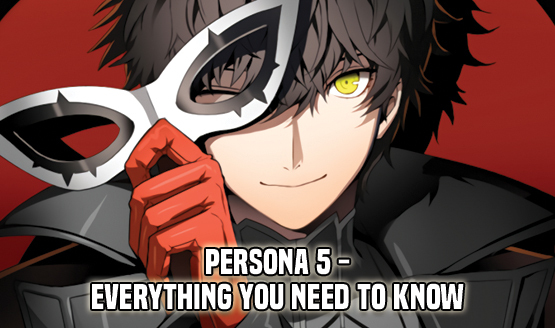 (I am Opinionated Girl, if you need that info, Atlus.) We also refer to random people like this. A driver who cuts you off is a Vulgar Boy, and a deliveryman who shows up a day early with your Amazon package is an Unforeseen Boy. Useful? Not really. But it’s fun! Unlike the other things on this list, when my friends and I say “for real? !”, we’re not being intentional. We’re just channeling Ryuji. The other day, I tried to order a caramel latte at Starbucks, and when the barista said they’d run out of caramel syrup, I said, “For real? 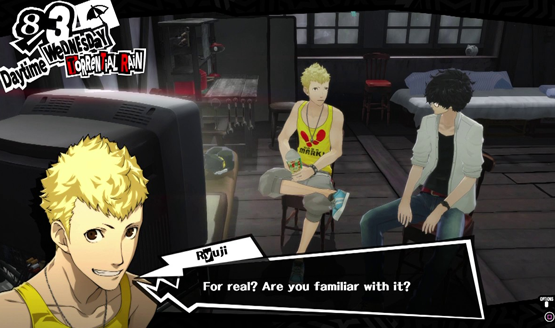 !” in Ryuji’s exact cadence, as if that’s a normal thing to do when you’re not playing video games. Have you worked any video game lingo into your daily life? Any other Persona 5 lingo that makes your list? Let us know in the comments below!